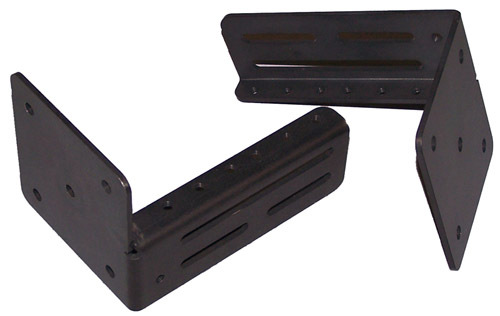 Available in both 2 RMS and 5 RMS versions, Siemon's Rack-IT vertical mounting brackets can be wall mounted to accommodate a wide range of rack mount network equipment. The vertical mounting brackets brackets can mount Siemon patch panels, rack-mount cable management and network equipment. Slotted openings allow mounting of network equipment at various depths for a variety of applications. Rack-IT vertical mounting brackets are designed for mounting IT network and telecommunication equipment onto the wall and are typically implemented in situations where space-saving is critical. The vertical mounting brackets are an ideal alternative to full-sized racks or cabinets for smaller moves, adds and changes. The 2 RMS Rack-IT is suitable for a 1 RMS patch panel and 1 RMS active equipment device or just a single 2 RMS panel or device. The 5 RMS Rack-IT allows for more hardware on a single Rack-IT and the flexibility to mix-and-match patch panels, rack-mount cable management and network equipment.